With arguably the biggest storyline to start the 2018 offseason, the Washington Redskins made a trade that brought over former Kansas City Chiefs QB Alex Smith, subsequently ending the Kirk Cousins era in Landover. 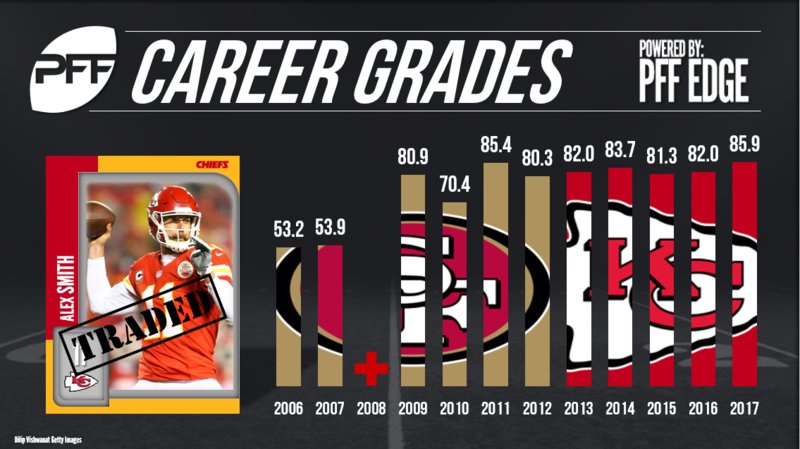 Shipping off upstart CB Kendall Fuller, the Redskins have their starting quarterback for the foreseeable future in Smith, who fielded the lowest interception rate from a clean pocket in 2017 and has graded above 80.0 in all but one of his last nine seasons. Aside from Smith, the Redskins also brought in former Seahawks WR Paul Richardson, former Bears edge Pernell McPhee and former Cowboys CB Orlando Scandrick. They’ll also see the return of Phil Taylor and Jonathan Allen along the defensive line in what could be a very different unit than the one that started this past season as we approach the start of the 2018. Despite the additions, the Redskins also lost starting center Spencer Long, wide receivers Terrelle Pryor and Ryan Grant, LB Will Compton, TE Niles Paul and edge Trent Murphy as well as the aforementioned Cousins from under center. A new look offense in Washington will still be searching for viable playmakers in the secondary and on offense as the draft approaches, but before then, what do Senior Analysts Steve Palazzolo and Sam Monson think of the Redskins moves so far?